A north Allerdale childcare provider was at risk of closure until it received more than £20,000 in grants. 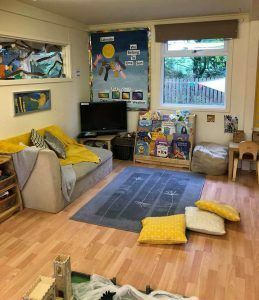 Bolton Low Houses Childcare Unit, near Wigton, was originally located in the village hall and moved to a temporary structure in 2004. Its lease was coming to an end and it had hoped to build a new permanent structure to continue operating but was unsuccessful in securing the large capital funding required. In 2016, the trustees secured a new 20 year lease and decided to refurbish the existing portakabin, thanks to £22,676 from various funds over the past two years, including the Joyce Wilkinson Trust, the Gurney Charitable Trust Fund, the High Pow Community Fund and the United Utilities Legacy Fund. The school offers full day-care for pre-school aged children and a play scheme (during the holidays up to 11 years). Serving local families up to a 15-mile radius, the school also offers youth volunteers much needed work-based experience, student apprenticeship training opportunities and volunteer posts. There is no other setting that provides the wrap-around care in the local area, and no other setting that offers a holiday club for babies through to 11 years old.